Rocky and I are still on our quest to thru-hike all the trails in the MetroPark System in the Greater Dayton, Ohio area. We have several parks to conquer, but the target on Saturday, March 3rd, was Possum Creek MetroPark off Frytown Road. The day was sunny and clear although a little chilly (high 30s-low 40’s). We layered up, grabbed our trekking poles, and headed out after breakfast. There are seven color-blazed trails at Possum Creek totally 9.2 miles. We parked just north of Argonne Lake and hiked the three loop trails that depart from this parking lot (purple – 1.4 miles, pink – 1.2 miles, and blue – 1 miles around the lake). We retraced a portion of the blue trail (0.4 miles) in order to connect with the longest trail – orange – 3.5 miles. We hiked a substantial portion of the orange trail (including a short side trail – blazed green – to the farm and back) until we came to the northern trailhead for orange, red and yellow loop trails. We hiked the yellow loop through the Tall Grass and Jean V. Woodhull Prairies. Then we walked the red loop (only half a mile) which was a short trail cutting across the Tall Grass Prairie. 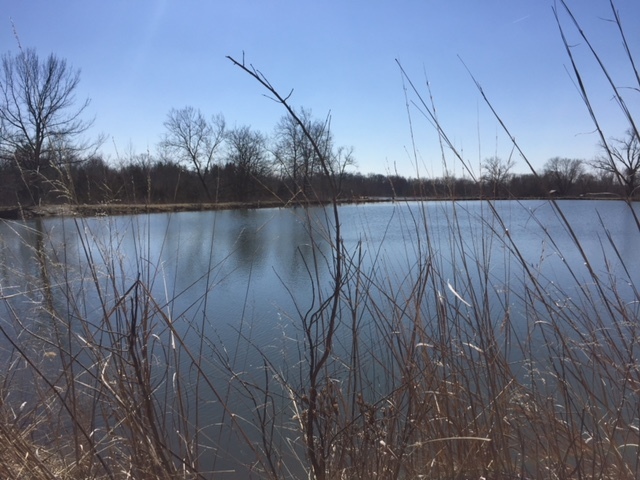 Finally, we completed the orange trail through a marshy area, alongside some fishing ponds, and once again around Argonne Lake. The terrain is nice and flat with very little elevation change. 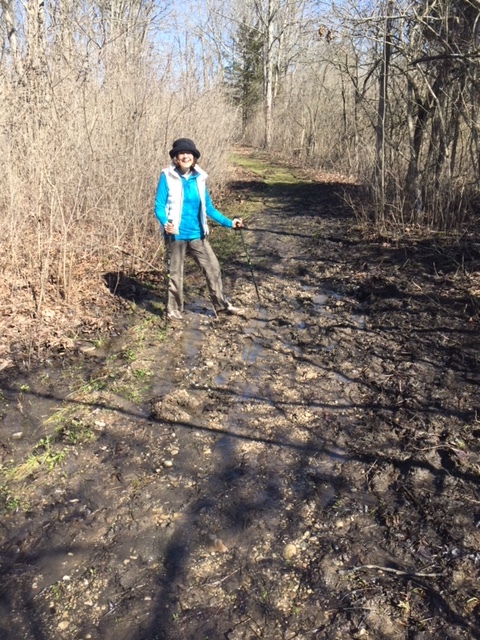 Our biggest challenge was the swampy nature of the path. We have had a good deal of rain in recent weeks and this park tends to retain that water along the flat trails through the prairies and marsh areas. But the day was lovely and the company was wonderful. I always enjoy my time with Rocky. We have great conversations, we laugh a lot at ourselves, and we have look forward to praying together as we walk. Argonne lake was beautiful although the ducks on the pond did not seem to appreciate our presence. The trail took us between some catch and release fishing ponds with lots of hopeful fishermen trying their skills. I didn’t see any poles bent over with the weight of a catch, but the fishermen looked content, bundled up against the cold breeze whipping across the waters. 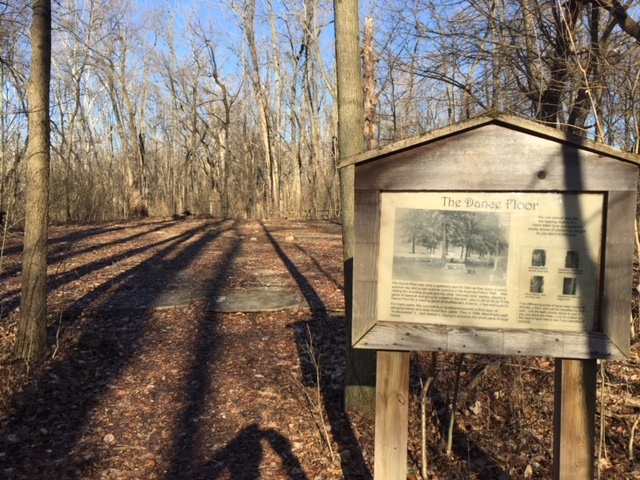 I also enjoyed seeing the remnants of Argonne Forest Park (an amusement park in the 1930s and early 1940s) in the North West corner of this Metropark including old streetcars and a dance hall. With wet feet and encouraged hearts, Rocky and I pounded some knuckles in victory as we checked off the mileage on our trail chart. The short ride home down I-75 was safe and sound. Getting out of the car after sitting for a while was not as easy. The muscles had tightened up and began to complain a bit when we needed them to limp into the house. A few grunts and groans later, we were safe inside and preparing some food for an afternoon snack.